Hi all! Welcome to the first official ScrapTiffany Blog Hop! Since this is the one year anniversary of ScrapTiffany the theme of this hop is celebrations. Woo hoo! Now, if you just happened to my blog, go on back to the beginning of the hop here: www.ScrapTiffany.com and you'll work you're way back here. Over the holidays I won some fun birthday themed papers from Creative Imaginations. Since my little guy's third birthday is coming up, I worked on a few projects for his day. Here is the invitation--don't you love the pennant banner sticker? The star punch is Martha Stewart. And here is a little goody bag. I used the tab sticker to close the top and figured I could write the kid's name on it too. And the birthday card for the star of the show. And since this weekend is also Valentines celebration, I thought I would share a quick and easy Valentine's card that is mass-producible (is that even a word lol!!!) Seriously though, with 2 pieces of cardstock, one piece of patterned paper, a spool of ribbon, some buttons and twine and my trusty white gel pen, I made six of these...take that Hallmark. Well, thanks for stopping by. While you're here, I would love if you would take a minute to follow my blog (there is a link to do so at the right). If you do and leave me a comment that you did I will choose someone randomly on Monday to win the rest of the birthday Creative Imaginations package. There are some papers left and lots of cute embellies. Now go on and enjoy the rest of the celebrations. Next up on the hop is Valerie. 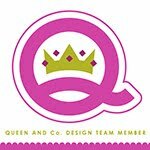 You can check out her fabulous projects HERE. Great stuff Rebecca! Thanks for sharing your wonderful work with us! the goodie bag looks really cute! The birthday invite and goodie bag are very cute! I love your mass producible :) vday card! Great invitation. Love them! Thanks for sharing. 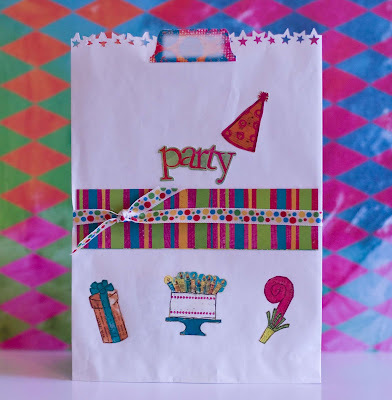 Love the bright colors on your party projects, and especially like the way you used the star punch on the top of the treat bags! The invite was great. Your work is great. love the invitations. and that valentine's day card is fabulous. I vote YES - mass producible is a word. Thanks for sharing. I need to make some party invites of my own. Love the invite! Very cute! Hope you have a great weekend! Cool stuff! Love the b-day card! i always wondered what else i could use those tabs for...great idea! everthing looks fab! Love your projects. Signed up to follow you. Can't wait to "poke around" on your blog and see what else you've created. WOW!!! Just adorable projects! You are sooo clever! Such fun to come visit your blog! Thanks for being part of this blog hop! i love your decorations! that star punch is adorable! Adorable! I love the colors you chose - so fun and festive!! Oh I love all your stuff. The valentines are wonderful. I am happy to be a new follower. Great projects! How inventive! TFS! Love your creations! Great work!! Love them all - thanks for sharing!! White gel pen on the Valentine? I had really thought you stitched it on the machine. Great job. Cute bday projects! Love the Valentine card too! So cute Rebecca! I love your invite and the goodie bags! The colors are so bright and cheery. Your 3 year old with love that party! What a cute idea for your little ones birthday. Kids birthdays are so much fun. I am looking forward to my grandson's birthday in March. Love the bright colors and simplicity of the VD card. Super cute and Great job! Thank you for sharing. I’m a follower. 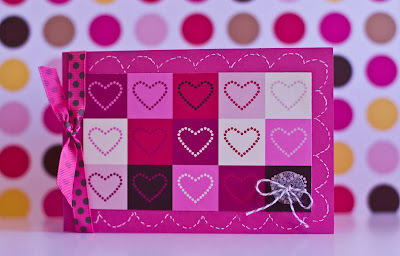 Cute projects and the valentine card is adorable! So fun! Your little guy is going to have an awesome celebration. Great Valentine's day card! Great birthday creations! I love the punches that you used. Love it - Thank you for the inspiration. Hi, I'm a new follower. 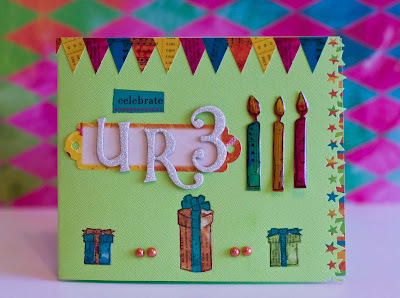 Really cute birthday projects. I especially love the birthday card. Great ideas!! I love the party invitation and the V-day card. Cute Stuff. Love hte invite and the Valentine's Day card. 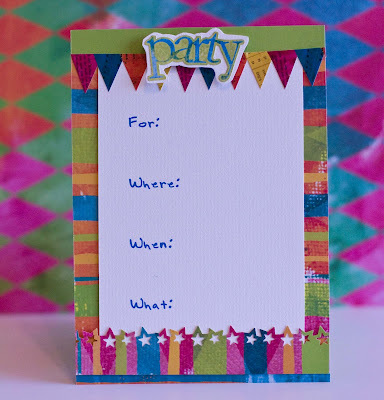 Love you party ideas. I need to plan for my little one's 2nd birthday next month so you've given be inspiration. How cute are these projects your son will love the card when he sees it in the future years. Great work. Great projects, I always love your stuff!! Enjoy the weekend!! Love your projects!! I am now a follower! New to your blog! Love the birthday invitation. The paper is delicious! Thanks for the inspiration! Fab projects. That star punch is a must have. Everything is so cute. Beautiful, inspiring work. Thanks so much for sharing. I have become a follower of your blog. cute, cute projects. thanks for the chance to win. I'm loving the star punch and how you used it. I signed up to follow your blog. I just found it on the blog hop and I really like it. Great ideas!!! Thank you for sharing you blog. I enjoy seeing others ideas!!! I'm a new follower. Cute party projects Rebecca! Love the colors! So much fun. I love the Birthday cards and bags they are great!! mass producible is definately a useable word! I really like the 'mass produce-able' card. Very cute and quick. Thanks for sharing your adorable projects. not only is the goodie bag cute BUT the invite is the cutest ever!!!! I love the goodie bags. All of the projects are so bright and cheery. thanks rebecca. i am a new follower and passing by to say great job on my hop. glad to find you and plan on checking back for all your projects. Such sweet projects! Your birthday party should be a real hit! Also love your valentine card! Hallmark has nothin' on you girl! Love the party creations. Awesome! HI, Rebecca!! What fun stuff. I really like that Valentine card and how you did the faux stitching. What cute valentine cards. I became a follower of your blog. I like that star punch and what a fun use for it. Your valentine did look easy, but I cheated and bought them for my kids' classes. I can always try again next year right? Cute idea for a boys birthday. How fun. Love your Valentine card. Always looking for ideas for cards. Wooohooo I am a new follower and I love your blog. Great projects I would love the chance at the balance of that paper it is bright and great. Did someone say goodies??? Love the card too!! Love all the party goodies for the little ones B-Day. He's going to love it! Thanks for sharing Rebecca...love the goodie bags! so cute. I really love the invitation! I just might have to scrap lift that idea! Your little guy is going to love it. All the other mom's will think you are the best mom. Oh my...these are so darn cute! I especially love the border on the treat bag...the little stars are so fun! Love your party invite and your mass produce Valentines. I love bright colors. I'm now a follower! I'd love it if you follow my blog as well. :) Thanks for the candy! cute cute cute stuff! loving the fun birthday gooodies! Wow those are awesome projects! Love the cute cards. They are so colorful and fun. Thanks for sharing I will now have to check out that star punch. I signed up as a follower too. I love that star punch, Rebecca!!! Such cute stuff you made, great job!! Hope you had a great weekend. I'm definitely a follower! I loce what you did with the Valentines Day Cards. Awesome idea! I like to go slow, and make sure everything is just perfect. So I have to start my holiday cards VERY early, lol! Wish me luck!